Maybe it doesn’t make all the headlines like receiving a Pulitzer or an Academy Award, but winning the prestigious Tea Guild’s Top London Afternoon Tea Award, is one of the highest accolades awarded in the world of tea. 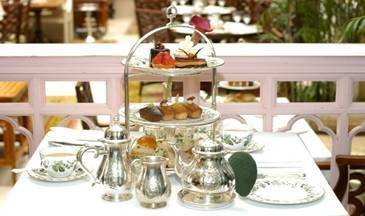 So hat’s off to the The Lanesborough for winning the 2008 award.This was due to The Lanesborough’s renowned tea selection and their ascribed tea sommelier, Karl Kessab, who offers you the best in service, selection and setting. Guests can enjoy the award-winning afternoon tea in the luxurious surroundings of the hotel’s new restaurant Apleys. They can converse with Kessab about the merits of the various teas, which are delivered to the table in Samovars (a traditional Russian water heating device.) In tribute to this award, The Lanesborough has created a new green tea blend, named Rose of the Orient — this rich in anti-oxidant tea is a blend of some of the world’s finest green teas including Sencha, China Wu and Pai Mu Tan, flavored with jasmine, cornflower blossoms and rose buds. Afternoon tea is served from 3:30 p.m. until 6.00 p.m. in Apsleys when you can selection from more than 30 of the finest teas from around the world personally recommended by Kessab. About The Lanesborough: The Lanesborough is one of the most celebrated properties in the world. The Lanesborough, ideally situated in London’s Hyde Park Corner, is an iconic property that distinguishes itself with residential-style service and elegant, historic accommodations. A member of the St. Regis Hotels & Resorts group, The Lanesborough is home to 95 guestrooms, including 43 suites, as well as the renowned Apsleys, Library Bar and Spa Studio.